Summer has well and truly arrived here in Perth. (To tell the truth, it is strictly only the beginning of spring but Perth is lucky enough to experience almost six months of summer each year!) Its onset this year was accompanied by a sudden change in the air, which extends beyond warmer weather and sunnier skies. It is more like a feeling, an atmosphere, of clarity and freshness, which tends to make one feel guilty for sleeping in late and staying indoors all day (in the best way possible). Suddenly, frittering time away at my laptop seems wasteful and I have been imbued with a renewed desire to do things. It may sound silly, but it is true! So, onto my third beauty post. I am so sorry to change tact midway through this series, but I have decided to break my beauty posts up into product categories. The marathon posts were a little overwhelming (for me, as I'm sure they were for you as well!) and I would like to be more specific and give you more choices for each category. Today I will be writing about sunscreen, and aging in general (so you don't necessarily need to skip this if you are already a sunscreen connoisseur!). And another apology ensues, because this will be a bit of a bossy rant. Sorry! But, trust me, if you heed my advice you will thank me in twenty years, if not sooner. To put it succinctly: WEAR SUNSCREEN. It is that simple. Wear it everyday. Wear it in summer. Wear it in spring. Wear it in autumn and winter. Wear it in the mornings. Wear it at midday. Wear it in the afternoon. Just wear it. Everyday, all day. Capiche? Let me break it down for you in FAQs. 1. Why should I wear sunscreen? There are two highly compelling arguments for wearing sunscreen daily. Firstly, because sun exposure makes you look old. Secondly, and of course most importantly, because sun exposure can kill you. Those two statements may precipitate a couple of questions: how does sunscreen accelerate the aging process? and how can it kill me? I will try to explain this in a way that is easy for everybody to understand. If you have anymore questions, please don't hesitate to ask me in the comments section! Science shows that environmental aggressors such as pollution, smoking, alcohol and, beyond all else, UV rays can wreak havoc on the skin. To put it simply, the UV rays stimulate an over-abundance of oxygen molecules in our bloodstream which, in turn, causes the proliferation of a process called oxidation, which is closely related to free radical damage. It is difficult to explain (and I am no scientist) but oxidation is the process whereby an oxygen molecule steals an electron molecule from a pair of electrons (electrons always travel in pairs). The lone electron (known as a free radical) then seeks out another partner, thereby stealing it from another electron pair, and so on, so forth, in a never-ending avalanche of cell destruction. Why is free radical damage so bad? Well, it isn't so bad, on its own anyway. Of course, it is inevitable that we will have oxygen molecules in our blood. We do need to breathe in oxygen, after all, which is why the aging process is inevitable. No matter how much sunscreen we wear throughout our lifetime, we will gradually look older; when we are adults, our skin will not be as taut or radiant as it was when we were children. However, it has been conclusively proven that sunscreen can make a vital difference when it comes to slowing down the aging process. (a) Slows down our cellular turnover. When our skin is healthy, it will regenerate itself every six weeks, which means that we are constantly being gifted with fresh, new, glowy cells. Free radical damage slows down that process, meaning that we are left with old dead skin cells on the surface of our skin, which makes our skin look lacklustre and gives it a rough, coarse texture. (b) Layers our cells unevenly. When the production of new skin cells is thwarted by free radical damage, the cells that are produced tend to be a funny shape and they don't lay flat and evenly on our skin's surface. This means that the light doesn't bounce off them like it does healthy cells, making our skin appear duller. It also means that water can easily escape our from intracellular fluid (the fluid between our cells) into the atmosphere, making our skin parched and dehydrated (which equates to crepiness and flakiness). Please see a previous post, Nature v Nurture, for photographic evidence! (d) Causes cancer, the most serious form being melanoma, which is deadly. How many of us have had parents and grandparents have to have cancerous moles removed from their face, hands and forearms? Surely you would want to spare yourself that fate, simply by applying a bit of sunscreen everyday! SPF, or sun protection factor, doesn't refer to strength, as is a common misconception. It refers to time. In order to figure out how long your sunscreen will protect you, just multiply the amount of time it takes for you to burn in direct sunlight without sunscreen (usually 5-10 minutes) with the SPF of your sunscreen. So, for example, if you are wearing an SPF15 sunscreen, and it takes you 10 minutes to burn in the sun, you have 150 minutes of protection. Likewise, the same person would have 300 minutes of protection. That is why it is so important to wear a high SPF, so you will be protected all day long. Please note that the Therapeutic Goods Association in Australia has very, very high standards when it comes to sunscreens, which is why many international brands' sunscreen products are not available in Australia. Also, the TGA does not allow brands to market their sunscreens as being any higher than SPF30. So if you are using a sunscreen with SPF40 or SPF50, it will be labelled SPF30+. The reason behind it is that Australia's sun is a lot stronger than anywhere else in the world, and the TGA is concerned that people will get a false sense of security if they believe that they have eight hours of infallible sun protection. Keep in mind that if you are spending the day in direct sunlight - i.e. at the beach - then it is important to reapply, even if you are not going in the water. Your sunscreen may melt from the heat, sweat and rubbing on clothes or towels. I would recommend that everybody wears SPF30+ everyday. And just so you know - wearing an SPF15 primer and an SPF15 moisturiser does not mean that you have double the protection! 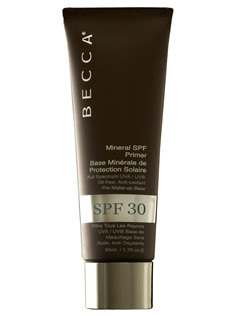 As I said, SPF is time, not strength, so you will still have 150 minutes in the sun before you need to reapply. 3. What does "broad spectrum" mean? Broad spectrum refers to whether or not the sunscreen offers protection from both UVA and UVB rays. UVA rays are the strongest rays. They penetrate beneath the surface of the skin, causing the cell damage and, ultimately, cancer. On the other hand, UVB rays damage the surface of the skin, causing the effects that we can see, like burning and peeling. The SPF refers to your protection against UVB rays. Unless your sunscreen is labelled as "broad spectrum", it will not protect you against UVA rays. The ingredients that provide UVA protection are zinc oxide, titanium dioxide and avobenzone. Unfortunately, in Australia there is a loophole whereby cosmetics companies are not required to divulge the ingredients they use in their sunscreens because they are considered pharmaceutical goods. Thankfully, every single sunscreen on Australian shelves undergoes vigorous testing by the TGA and they are labelled accurately as being "broad spectrum" or not according to the effectiveness of their ingredients. 4. What is the difference between physical and chemical sunscreens? A physical sunscreen contains zinc oxide and/or titanium dioxide. They sit on the surface of the skin and deflect the sun's rays. A chemical sunscreen contains ingredients like avobenzone. They absorb and neutralise the sun's rays. The commonly held belief is that chemical sunscreens are less effective than their physical counterparts. That is not necessarily the case. From my understanding (it is a contentious issue, but I have done some research on the matter to make sure), you can choose your sunscreen purely by the SPF and whether or not it is broad spectrum; you do not have to worry too much about the ingredients themselves. If you would rather avoid chemicals, then by all means choose a physical sunscreen (although your physical sunscreen will also contain chemicals). 5. Can I get by with just a moisturiser/ foundation/ powder/ primer that contains sunscreen? No, you cannot - unless you are willing to use a full teaspoon of moisturiser/foundation/ powder/primer all over your face, which is generally far too much product, therefore not attractive nor economical. The exception would be if you have exceptionally dry skin and your moisturiser contains SPF30+, in which case you may feel that a teaspoon is the amount of moisturiser you need each morning (although you probably just need a richer cream). 6. But don't I need Vitamin D? Yes, you do need Vitamin D! However, the hype surrounding Vitamin D deficiency has been too quick to pin the blame upon increased usage of sunscreen. The truth is that in order to get sufficient Vitamin D, all we need is five per cent of our bodies exposed to direct sunlight, 15 minutes per day. That is simply hanging out the washing, taking a quick walk or even driving the car with one of your forearms exposed. I think the issue underlying low Vitamin D levels is not sunscreens but the fact that people are not spending as much time outdoors. If you are concerned about your Vitamin D levels, keep in mind that you don't need to wear it absolutely everywhere, but you should definitely wear it on your face, neck, decolletage and the backs of your hands. 7. Do I really need to wear sunscreen in winter? Not necessarily. You only need to wear sunscreen when the UV index is above 3. You can check the Cancer Council website for the daily index. If it is very cloudy and rainy outside then it may be safe to say that you don't need to wear sunscreen that day. However, we (most of the people reading this blog, anyway!) live in Australia, where winter is accompanied by clear skies. Those days, you generally do need to wear sunscreen. Rather than chopping and changing according to how the weather looks in the mornings, or checking the Cancer Council website daily, why not just get into the habit of applying your sunscreen everyday as part of your beauty regime? You won't even have to think about it! 8. But sunscreens are greasy and heavy and they don't smell very nice! Yes, that is true - for some! But let me tell you, there are also some really lovely sunscreens out there, waiting for to enthrall and impress you and encourage you to take pleasure in wearing them every single day - which is the very reason I wrote this post. 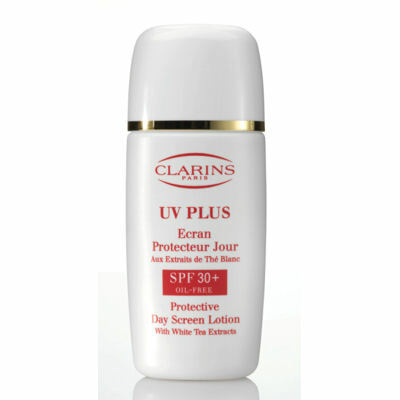 I wear this beautiful Clarins sunscreen everyday, without fail. 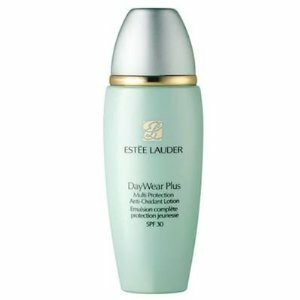 The light, fluid texture is absolutely divine and it smooths out my skin perfectly, acting as a primer when I am too lazy to wear any. It leaves no white cast at all. It is oil-free with a silky matte finish, but not drying in the slightest. The tube is tiny but strangely lasts me months and months. It is an investment but absolutely worth it. I know I said that you cannot use your primer as your sunscreen, but this lovely product is an exception. It is an oil-free, mineral-based, zinc sunscreen that is beautifully lightweight and has the added bonus of keeping makeup fresh all day long. It feels like nothing on the skin. This sunscreen is absolutely lovely. I wear it when my skin is feeling a little dehydrated during winter or when I am sick because it contains hyaluronic acid (that magical water-binding agent I spoke about in an earlier post). It is also imbued with Vitamin E and pomegranate extract, antioxidants which aid in neutralising those pesky free radicals. This is the product that I use on my decolletage and hands daily. It would be a perfect choice for those of you who need hydration without the accompanying greasiness. 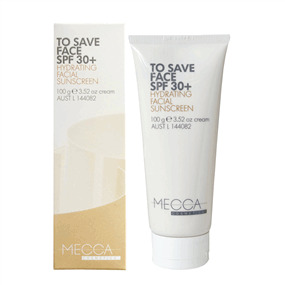 The Kit sunscreen is very similar to the Mecca product, as they are manufactured by the same company. The Kit version is fragrance-free with a slightly lighter, matte finish. Also, the tube is extra cute! 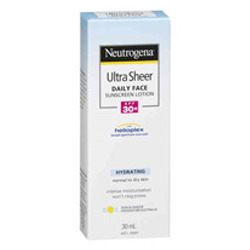 I love the Neutrogena Ultra Sheer Daily Face Sunscreen Lotion because it is lightweight, oil free (great for oily skinned girls like myself), sinks easily into the skin and does not leave the dreaded sunscreen "grease" layer on the face. Retailing for $11.95 AUD, it's one of the best low price point facial sunscreens on the market. This was a fantastic post because it is so informative, and I need to know the reasons behind something before I will employ it myself, but often I am far too lazy to do the gruntwork, so I'm so happy that you did it all for me and made it so easy and enjoyable to read! I would like to add to the point that I very rarely used sunscreen when outdoors, and I still managed to obtain a deficiency of Vitamin D, so in my case at least it is also totally unrelated to sunscreen application, although today I was reminded of what you have always said (before even noticing the new post!) and I put some on, so thank you! I like to have the best of everything so I am going to hunt down the Clarins as soon as I have the time. Ahem, or you could lead me in the right direction. But seriously, thank you. I hope I haven't damaged my skin too much already, and that it still looks youthful in 20 years! If so, you will definitely be receiving a thankyou basket ha ha ha. Hi Laura, I discovered your blog tonight after reading your guest post for Sarah Ayoub's Wordsmith Lane. I think your blog is fabulous! I can really relate to so much of what you write. I loved this beauty secrets post. You have actually helped me choose beauty products before - we realised that we go to the same uni (and both do law). I've been meaning to start my own blog for a while now, and seeing how someone just like me can create a blog as lovely as yours may just inspire me to do it! What a great, informative post... For years I rarely wore sunscreen unless I knew I'd be outdoors for a few hours in summer (I hated the greasy, oily feeling - and being so pale, I just wanted to tan! When I saw a dermatologist in July this year, he chastised me for not wearing one. He gave me a brand called Cetaphil (frangrance free, hypo-allergenic, broad spectrum, SPF30+), which you can pick up in chemists. To also back up what you said Laura, he told me that a lot of my skin issues (blemishes, scarring and pigmentation) were actually enhanced by sun exposure -you can be sure I have used sunscreen every single day ever since!! I love these beauty posts, you are so clever! I am a total sunscreen nerd now, after years of ignoring my mother when she told me to put on sunscreen. Now I am told I sound like my mother when urging others to wear sunscreen, but I don't care! Lol you read my blogger mind because I have just been preparing a sunscreen post on my own blog. I know firsthand the effects of the Australian sun on fair skin so I applaud this post. Laura, I'm also of the belief that 'at risk' skins - like really fair skin or those with a family history of skin cancer - absolutely need a sunscreen which is at least partially composed of a physical blocker - zinc or titanium - as the chemical sunscreens alone are not protective enough on at risk skin. Have you heard of this? As I said in the post, there is a perception that physical sunscreens are more reliable than chemical sunscreens but according to my research there is virtually no science to back that up. One brand I worked for even used a purely chemical sunscreen as their heavy-duty, beach sunscreen because physical sunscreens are more easily sweated or rubbed away. If you know of any research that suggests otherwise please let me know! The best advice I have is, if in doubt, to use a hybrid; a sunscreen that contains both physical and chemical blockers. With respect to avobenzone (the one broad spectrum chemical blocker - of course any other chemical blocker is not as effective as physical blockers because it does not protect against UVA rays), only one study I have read managed to show that it had degenerated at a faster rate to physical sunscreens. Unfortunately that study was never published in a scientific journal because it was not conducted under satisfactory scientific conditions (a very small sample size, in a petri dish) - it was only written up in a health magazine, which is the source of its bad reputation. Also research showed that the degeneration rate was halved over 72 hours. Clearly, 72 hours is far too long to be relying upon your sunscreen for anyway! My philosophy is that as long as you are using a broad spectrum, SPF30+ sunscreen you should be okay. That said, I have olive skin so I say, do what is best for you. If you find that physical blockers are more effective for your skin, then by all means favour them.